Gobi Desert & Horse Trekking to Orkhon Valley National Park. This trek combines two beautiful universe: the rock formations and sand dunes of the Gobi desert, with the steppe and grassland of the Orkhon Valley. Start with a jeep tour at the South of the country to see stunning natural formations. Clime the Khongoryn Els sand dunes, ride a camel and try to spot dinosaur fossils at Bayan Zag flaming cliffs. Look for ice it the middle of the desert at the surprising Vulture Valley gorge. Plus visit the Tsagaan Suvarga, Baga Gazar and the Ongii Monstery. You will have the chance to camp in areas free of people under star filled sky, surrounded by beautiful landscape. The second part of your trip will drive you to Central Mongolia in UNESCO’s World Heritage site, the Orkhon Valley. You will first stop to visit Khar Khorum, Chinggis Khan’s famous capital and its Buddhist Monastery Erdene Zuu. Then you will meet your horses and start your 4 days horse trek across the Valley. Its vast grassland makes it the perfect place for some galloping. You will then visit the Tovkhon Monastery located at 2600m above see level. This monastery can only be reached on foot or horseback. Finally you will see the famous Orkhon Waterfall and, if you feel adventurous, might climb down to the waterfall basin and have a swim. 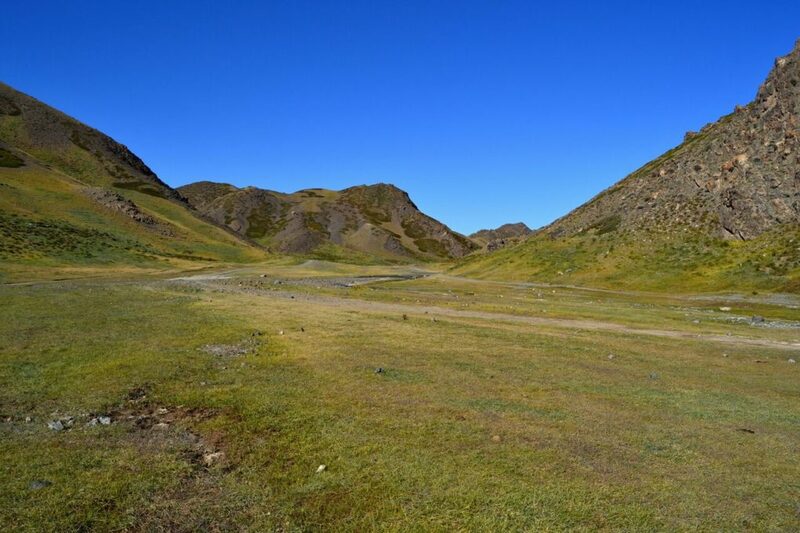 Most of all, the Orkhon Valley is home to many nomadic families and herds of yaks, horses and sheep. Therefore don’t hesitate to stop to share some milk tea with a family who will be pleased to receive some visitors. At the end of this trek you will stop in the Hustai National Park where you will have the chance to observe the Takhi, Mongolian Wild Horse. This horse is now the last wild horse species on Earth. This park is also the home of many other animals such as the red deer and grey wolf. Day 1. Travel to Baga Gazar Mountain Nature Reserve. We will travel to the Mongolian Gobi desert by car. On the way, we will stop to visit the Baga Gazar mountain nature reserve. This mountain is composed of granite rock massifs. It is home to wild sheep and wildlife that you might have the chance to see. We will stay overnight in tents, our camping spot located deep inside of rock formations. Day 2. Tsagaan Suvarga /Mud Stone Nature Formations/. In the morning, we will head towards the Mongolian Gobi desert which occupies one third of the country’s total area. 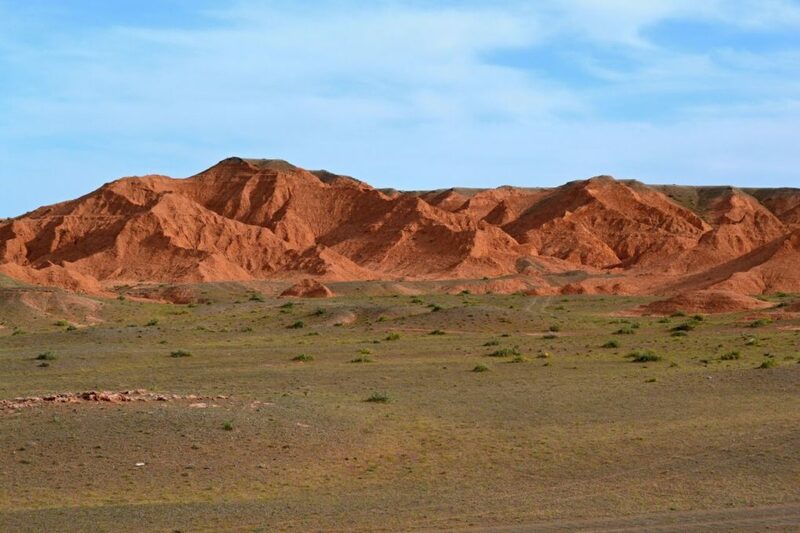 On the way, we will stop at the Tsagaan Suvarga mud stone nature formation. We will reach the Tsagaan Suvarga and see the different rock formations while hiking around. 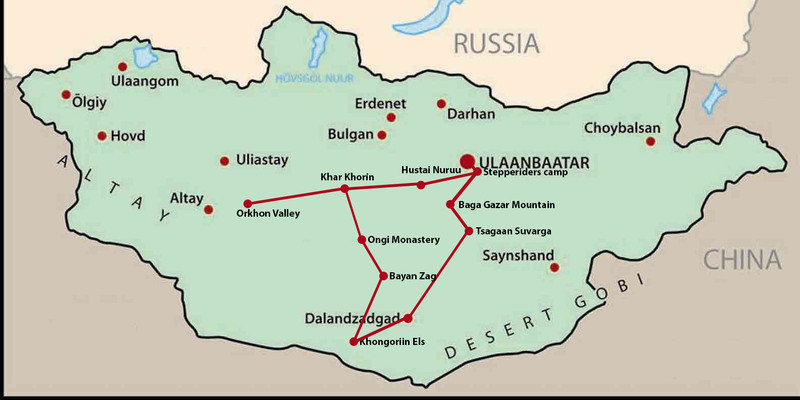 We will start traveling to Yolyn Am, known as ‘Vulture Valley’, and the Dungene valley. This wonderful picturesque place has ice even in summer, and is surrounded by sheer rocky walls, forming incredible canyons. Enjoy a short hike and to take pictures of this exceptional landscape and wildlife. You will then visit the Gobi museum. These areas are located in what is called “the Three Beauty of Gobi mountain national park” which covers the most southern points of the Altai Mountains. Stay overnight in tents, in a valley of mountains. Day 4. Khongoryn Els /Sand Dunes/ & Camel Ride. We will drive to the Sand Dunes named Khongoryn Els. It is one of the largest sand dunes in the country and it is 125km long, 20km wide and 400m high. It will be quite a challenge to climb to the summit to capture some photos. We will climb to the top of the dune and do some camel riding on sands. Later we will stop to visit at nomadic family and transfer to camping place for overnight at tents, nearby sand dunes. In the morning, we will drive 4 hours to the famous Bayan zag, Falming Cliffs, where important fossils have been found. It was indeed the place where first dinosaur fossils where discovered. It became famous after the visit of American paleontologist Roy Chapman Andrews in the 1920s. There is also a picturesque saxaul forest after which this place was name and colorful rocks. Stay overnight in tents, next to nearby cliffs. We will head off to Central Mongolia and to Gobi desert will slowly disappear from our sight. Will visit the Ongi monastery ruins located between the Gobi desert and grassland. 500 monks used to live in this monastery. It was built in the late 18th century to honor the Dalai Lama’s first visit to Mongolia. The monastery was restored in 1990 after destruction from the socialist regime and the current Dalai Lama visited it in 1992. Stay overnight in tents, on the Ongi riverside. Day 7. Trip to Orkhon Waterfall / Orkhon Valley National Park. We will arrive in the beautiful Orkhon Valley national park and experience a complete change of landscape traveling now in grassland. We will see the Orkhon waterfall, highest waterfall and gorge in the country which is the park’s highlight. In the evening, we will meet our horseman family and his lovely horses. Stay overnight in tents close to the Orkhon river. Day 8 – 9. 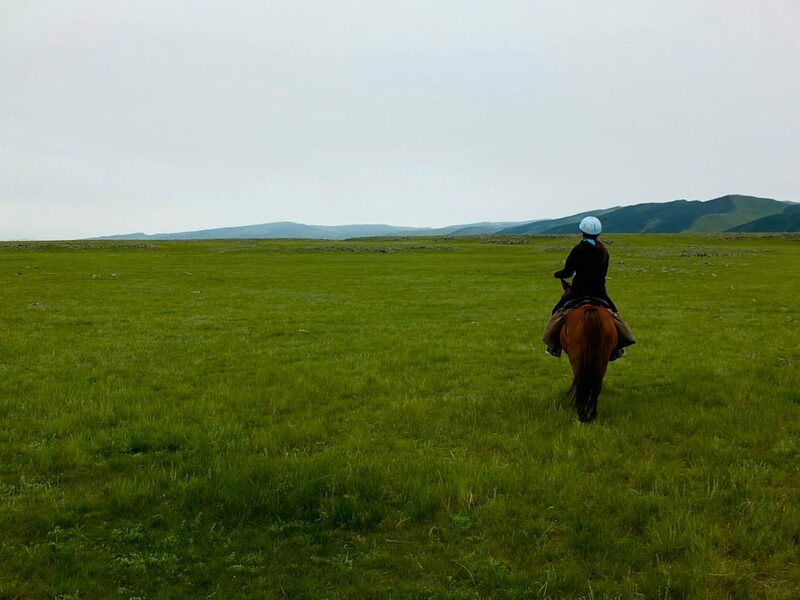 Start Horse Riding Through Orkhon Valley National Park. We will start start our horse adventure trekking through the famous Orkhon Valley national park, included in the UNESCO World heritage sites. During those two days, we will enjoy galloping in the park and see hundreds of horses, yaks and nomads. We will take break to visit nomadic family to experience from their lifestyle and share some milk tea and food. We will ride about 30-35km per day and riding route is easy and beautiful. Day 10-11. Horse Riding to the Kara korum City /Ancient Capital of Genghis Khan. In the morning, we will continue our horse riding through the open area and will arrive in the famous Kara Korum city. It was Mongolia’s political capital in 13th century for about 40 years before Khublai Khan decided to move it. We will visit a local museum and the first Mongolian Buddhist monastery ‘Erdene zuu’ which was built after the city destruction. Our horse trek will end there and we will say our goodbyes to our amazing horses and horseman. Stay overnight in tents, at the riverside. Day 12. Drive to Hustai National Park & See the Mongolian Wild Horses or Steppe Riders camp. In the morning, we will travel back to Ulaanbaatar by car. On the way, we will stop at the Hustai national park to see the Mongolian wild horses Takhi and wildlife. It is rare opportunity to watch the Takhi horses in the wild. We can stay overnight at tents, or drive directly to Stepperiders’ camp and sleep in one ger. Day 13. Ulaanbaatar & Departure. Transfer to Ulaanbaatar and farewell. : 4 – 5 pax 1.950 USD per person. : 2 – 3 pax 2.250 USD per person.